Instantly add voice to your business. Add voice and text (everyday English) to your current web-based, mobile or embedded applications. Let us call your API's from our Conversation Server. a GUI in a browser or mobile app. 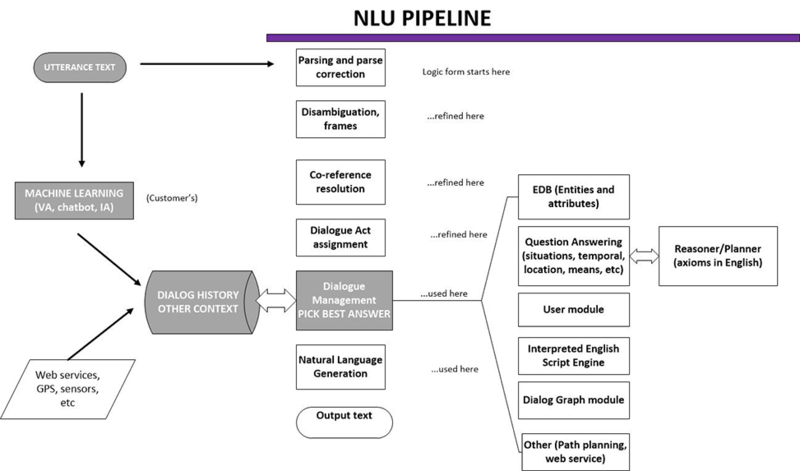 Conversations server (NLU Pipeline, below) converses with the user, gathers and clarifies information, calls the same API’s as your mobile app, browser or embedded interface. Integration typically takes a couple of days—we'll help you do it. Get control over Machine Learning (ML) generated answers. How? 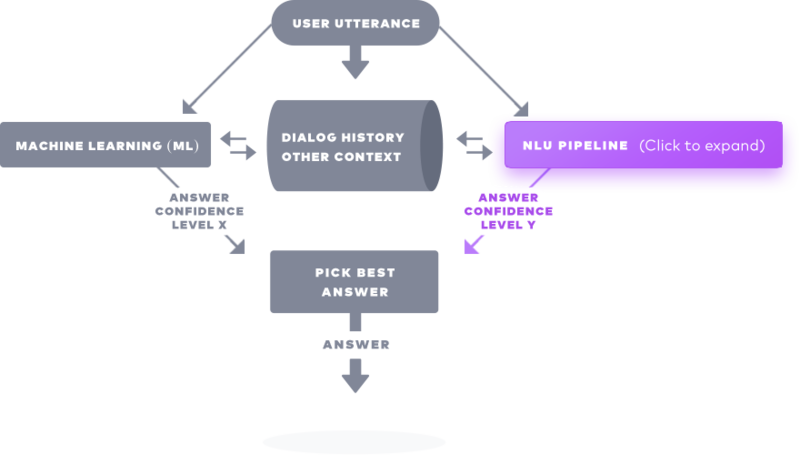 By complementing your ML software (Virtual Agent, chatbot, IA) with our massively rule-based NLU pipeline. Our rule-based pipeline working side-by-side with your ML software will enable your chatbot to answer more precisely. Machine Learning (your code) provides coverage. Rule-based (our pipeline, below) provides precision and control over answers. Make sense of more user utterances. Better deal with UMM (unsupported, misunderstood, mismatched utterances). Extract ALL the entities and relations, modality and negation from utterances. Handling more dialogue acts, including user clarification requests. Use reinforcement learning to take the user's sentiment into account when answering. Co-reference resolve pronouns, nouns, adverbials. Use context to resolve ellipsis (missing verbs, nouns, etc) and do co-reference resolution. Handle complex dialogue graphs, where the next prompt depends on the user's answer to a previous question.